If you’re looking for an easy pie recipe that requires no baking or pie making skills, look no further. 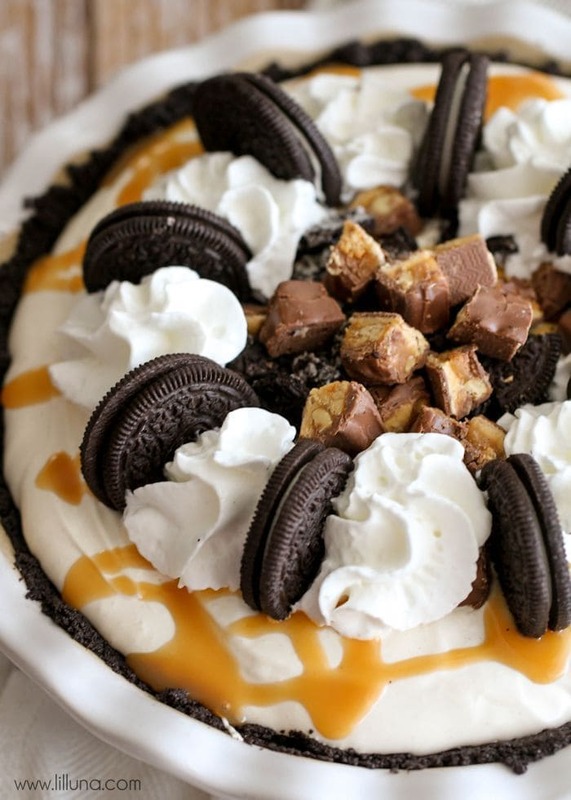 This Oreo Snickers Pie is a chocolate lover’s dream! 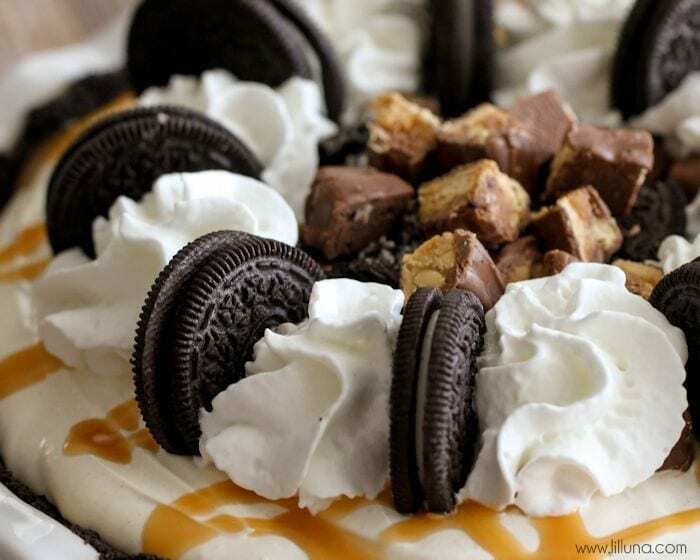 With an Oreo Pie crust, pieces of Snickers, a rich and creamy filling, topped with MORE snickers, Oreos, and whipped cream, this pie will disappear in minutes!! Who loves pie?! Not sure why I even ask because I don’t think I’ve ever met someone who didn’t like pie. The only problem is, I’m no pie maker and don’t have much experience making them. Fortunately, we have good friends who invite us over every March 14th (Pi Day) to enjoy the yummy dessert. 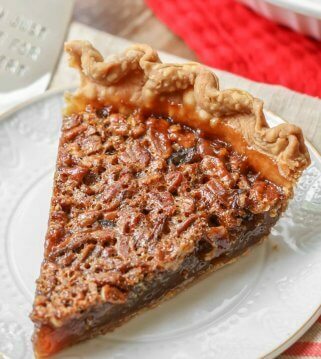 Yes, I know… that was a while ago, but that’s when I made the pie that I’m sharing with you today. I wanted to come up with a pie that I knew any candy and chocolate lover would enjoy, so I made this Oreo Snickers Pie, and let me tell you – it was SO good!! Once you have the crust, add 2/3 of the cut up Snickers to the bottom of your crust. In a bowl, combine the cream cheese, caramel syrup, and powdered sugar and mix well. Fold in the Cool Whip and mix until it is all well combined. Pour this mixture over the snickers, and refrigerate for 2-3 hours. Right before serving, drizzle on a little extra caramel syrup and place the last of the snickers pieces in the middle of your pie. Add dollops of cool whip around the candies and place whole Oreos in between each dollop. Serve immediately! Even though I don’t make pies often, I’m thinking I could get the hang of it. 😉 Especially with recipes this easy and delicious. 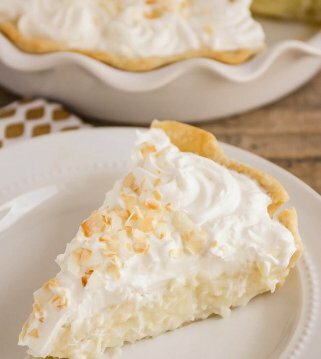 If you're looking for an easy pie recipe that requires no baking or pie making skills, look no further. 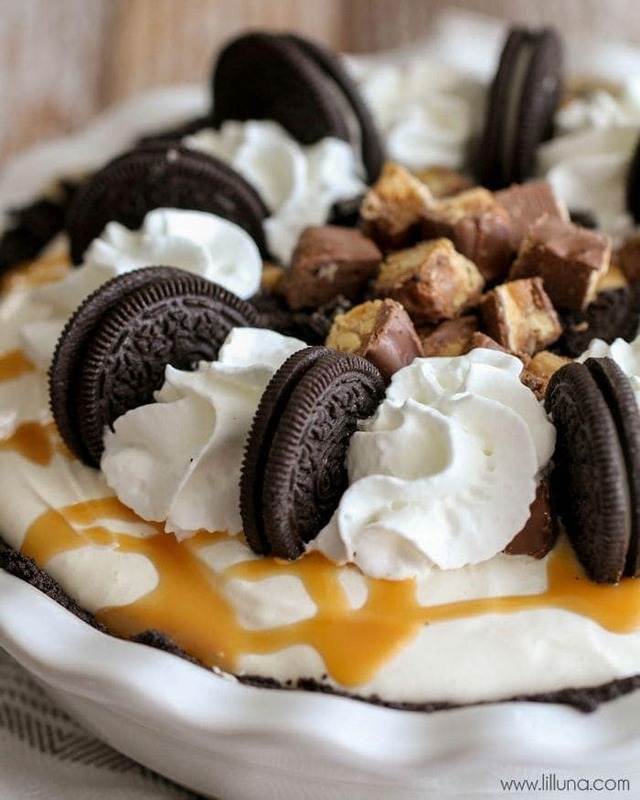 This Oreo Snickers Pie is a chocolate lover's dream! 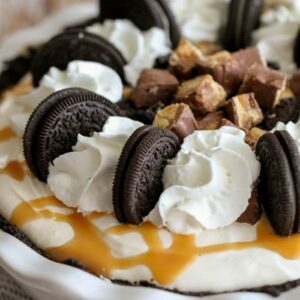 With an Oreo pie crust, pieces of Snickers, a rich and creamy filling, topped with MORE snickers, Oreos, and whipped cream, this pie always disappears in minutes!! 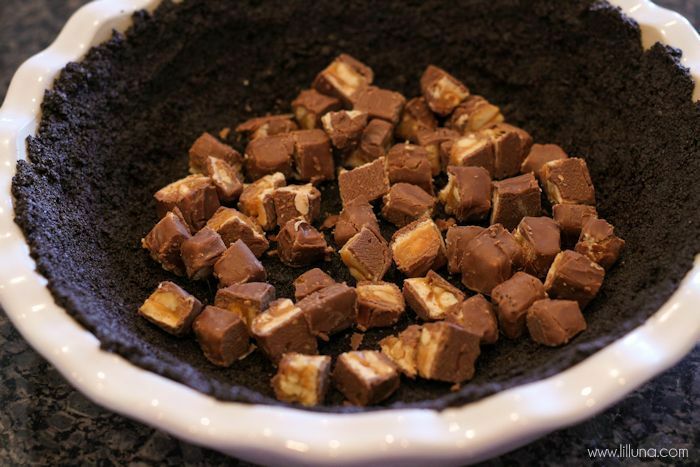 Add ⅔ Snickers to the bottom of your crust. In a bowl mix cream cheese, caramel syrup, and powdered sugar and mix well. Fold in Cool Whip and mix until it is all well combined. Pour this mixture over the snickers. Refrigerate for 2-3 hours. Right before serving, drizzle on a little extra caramel syrup. 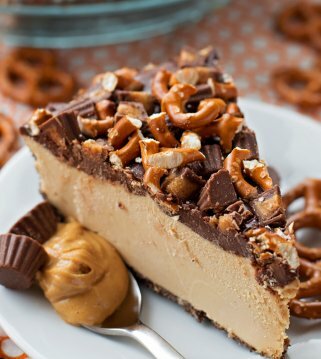 Place last of the snickers pieces in the middle of your pie. Add dollops of cool whip around the candies and place whole Oreos in between each dollop. THINK i COULD get away with doing the caramel drizzle and reddiwhip and snicker topping a few hours before and bring it all already done? or would it all melt and look awful? My hubby really wants me to make this one, he said it looks really good, and he is dang right!